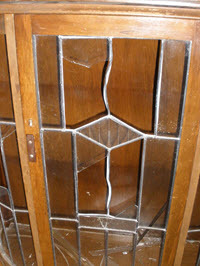 Leadlight restoration is our specialty. From fixing a broken piece of glass in a china cabinet, to completely restoring a church window, we will return your leadlight to its former glory. Our repairs are usually invisible and we can usually match the existing glass. Send us a picture of your damaged leadlight and we can usually quote from that, or we are happy to come around and advise on the best way to deal with it. Usually the leadlight needs to be removed from the frame and brought back to the workshop for repair work but we can sometimes fix on site. This does not give as good a quality repair job but does save having to take it out if it is very large or fragile. We also offer a removal and packing service should you wish to take a leadlight with you when you move house.